Western civilization at the present day is passing through a crisis which is essentially different from anything that has been previously experienced. Other societies in the past have changed their social institutions or their religious beliefs under the influence of external forces or the slow development of internal growth. But none, like our own, has ever consciously faced the prospect of a fundamental alteration of the beliefs and institutions on which the whole fabric of social life rests ... Civilization is being uprooted from its foundations in nature and tradition and is being reconstituted in a new organisation which is as artificial and mechanical as a modern factory. Never support a law that you wouldn't be willing to see your own worst political enemy enforce upon you. It's time we stood up the federal monstrosity that continues to rob us blind. This is a great initiative. Hat tip: Western Rifle Shooters. 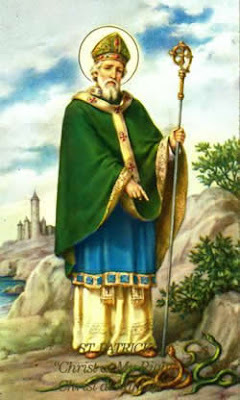 EWTN has a great commentary on the life and history of Patrick of Ireland. Read it here. Who's to Blame for the Current Economy? Imagine a Kindergarten class where the teacher gives pixie sticks and soda pop to all the kids, and then leaves the room for a few minutes. When she comes back and finds the classroom trashed, who do you blame? That's a pretty good analogy of our current economy and who's to blame for it, since depending on who you ask will determine the answer you receive. Common Sense lost ground when parents attacked teachers for doing the job that they themselves had failed to do in disciplining their unruly children. It declined even further when schools were required to get parental consent to administer sun screen or an aspirin to a student; but could not inform parents when a student became pregnant and wanted to have an abortion.